It follows the English transcript of the treaty. The boundary-line between the two countries, west of the Mississippi, shall begin on the Gulph of Mexico, at the mouth of the river Sabine, in the sea, continuing north, along the western bank of that river, to the 32d degree of latitude; thence, by a line due north, to the degree of latitude where it strikes the Rio Roxo of Nachitoches, or Red River; then following the course of the Rio Roxo westward, to the degree of longitude 100 west from London and 23 from Washington; then, crossing the said Red River, and running thence, by a line due north, to the river Arkansas; thence, following the course of the southern bank of the Arkansas, to its source, in latitude 42 north; and thence, by that parallel of latitude, to the South Sea. The whole being as laid down in Melish's map of the United States, published at Philadelphia, improved to the first of January, 1818. But if the source of the Arkansas River shall be found to fall north or south of latitude 42, then the line shall run from the said source due south or north, as the case may be, till it meets the said parallel of latitude 42, and thence, along the said parallel, to the South Sea: All the islands in the Sabine, and the said Red and Arkansas Rivers, throughout the course thus described. to belong to the United States; but the use of the waters, and the navigation of the Sabine to the sea, and of the said rivers Roxo and Arkansas, throughout the extent of the said boundary, on their respective banks, shall be common to the respective inhabitants of both nations. All the grants of land made before the 24th of January, 1818, by His Catholic Majesty, or by his lawful authorities, in the said territories ceded by His Majesty to the United States, shall be ratified and confirmed to the persons in possession of the lands, to the same extent that the same grants would be valid if the territories had remained under the dominion of His Catholic Majesty. But the owners in possession of such lands, who, by reason of the recent circumstances of the Spanish nation, and the revolutions in Europe, have been prevented from fulfilling all the conditions of their grants, shall complete them within the terms limited in the same, respectively, from the date of this treaty; in default of which the said grants shall be null and void. All grants made since the said 24th of January, 1818, when the first proposal, on the part of His Catholic Majesty, for the cession of the Floridas was made, are hereby declared and agreed to be null and void. The renunciation of the United States will extend to all the injuries mentioned in the convention of the 11th of August, 1802. 1. 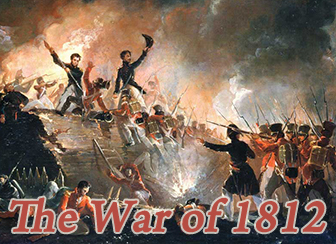 To all the injuries mentioned in the convention of the 11th of August, 1802. 4. To all claims of Spanish subjects upon the Government of the United States arising from unlawful seizures at sea, or within the ports and territorial Jurisdiction of the United States. Finally, to all the claims of subjects of His Catholic Majesty upon the Government of the United States in which the interposition of his Catholic Majesty's Government has been solicited, before the date of this treaty and since the date of the convention of 1802, or which may have been made to the department of foreign affairs of His Majesty, or to his Minister of the United States. The convention entered into between the two Governments, on the 11th of August, 1802, the ratifications of which were exchanged the 21st December, 1818, is annulled. The said Commissioners shall be authorized to hear and examine, on oath, every question relative to the said claims, and to receive all suitable authentic testimony concerning the same. And the Spanish Government shall furnish all such documents and elucidations as may be in their possession, for the adjustment of the said claims, according to the principles of justice, the laws of nations, and the stipulations of the treaty between the two parties of 27th October, 1795; the said documents to be specified. when demanded, at the instance of the said Commissioners. 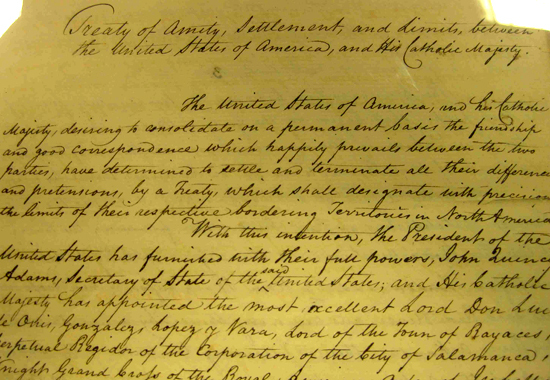 The records of the proceedings of the said Commissioners, together with the vouchers and documents produced before them, relative to the claims to be adjusted and decided upon by them, shall, after the close of their transactions, be deposited in the Department of State of the United States; and copies of them, or any part of them, shall be furnished to the Spanish Government, if required' at the demand of the Spanish Minister in the United States. Ferdinand the Seventh by the grace of God, and by the Constitution of the Spanish Monarchy, King of the Spains. Therefore having seen and examined the sixteen articles aforesaid, and having first obtained the consent and authority of the General Cortes of the Nation with respect to the Cession mentioned and stipulated in the 2d and 3d articles, I approve and ratify all and every one of the articles referred to and the clauses which are contained in them; and in virtue of these presents I approve and ratify them; promising on the faith and word of a King to execute and observe them, and to cause them to be executed and observed entirely as if I myself had signed them: and that the circumstance of having exceeded the term of six months, fixed for the exchange of the ratifications in the 16th article may afford no obstacle in any manner; it is my deliberate will that the present ratification be as valid and firm and produce the same effects as if it had been done within the determined period. Desirous at the same time of avoiding any doubt or ambiguity concerning the meaning of the 8th article of the said treaty in respect to the date which is pointed out in it as the period for the confirmation of the grants of lands in the Floridas, made by me or by the competent authorities in my Royal name, which point of date was fixed in the positive understanding of the three grants of land made in favour of the Duke of Alagon, the Count of Punonrostro, and Don Pedro de Vargas, being annulled by its tenor; I think proper to declare that the said three grants have remained and do remain entirely annulled and invalid; and that neither the three individuals mentioned, nor those who may have title or interest through them, can avail themselves of the said grants at any time or in any manner: under which explicit declaration the said 8th article is to be understood as ratified. In the faith of all which I have commanded to despatch these presents signed by my hand, sealed with my secret seal, and countersigned by the underwritten my Secretary of Despatch of State. Given at Madrid the twenty fourth of October one thousand eight hundred and twenty. "In Senate of the United States, February 19th, 1821. Resolved, two-thirds of the Senators present concurring therein, that the Senate having examined the treaty of Amity, Settlement and Limits between the United States of America and his Catholic Majesty made and concluded on the twenty-second day of February, 1819, and seen and considered the Ratification thereof, made by his said Catholic Majesty on the 24th day of October, 1820, do consent to, and advise the President of the United States to ratify the same." "Now, therefore, I, James Monroe, President of the United States of America, having seen and considered the Treaty above recited, together with the Ratification of His Catholic Majesty thereof, do in pursuance of the aforesaid advice and consent of the Senate of the United States, by these Presents, accept, ratify, and confirm the said Treaty and every clause and article thereof as the same are herein before set forth." "In faith whereof I have caused the Seal of the United States of America to be hereto affixed." "Given under my Hand at the City of Washington this twenty-second day of February in the year of our Lord one thousand eight hundred and twenty-one, and of the Independence of the said States the forty-fifth. (Signed) JOHN QUINCY ADAMS Secretary of State." And whereas the said Ratifications, on the part of the United States, and of His Catholic Majesty, have been this day duly exchanged at Washington, by John Quincy Adams, Secretary of State of the United States, and by General Don Francisco Dionisio Vives, Envoy Extraordinary and Minister Plenipotentiary of His Catholic Majesty: Now, therefore, to the end that the said Treaty may be observed and performed with good faith on the part of the United States, I have caused the premises to be made public, and I do hereby enjoin and require all persons bearing office, civil or military, within the United States, and all others, citizens or inhabitants thereof, or being within the same, faithfully to observe and fulfill the said Treaty and every clause and article thereof. Done at the City of Washington, the twenty-second day of February, in the year of our Lord one thousand eight hundred and twenty-one, and of the sovereignty and independence of the United States the forty-fifth. Here is the print version of the Treaty with Spain of February 22, 1819, as finally ratified from the Library of Congress.